I've never been into a Lush store before. There, I've said it. 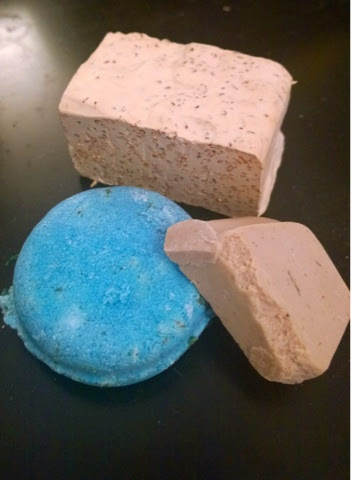 I know I may be very late to the Lush party but I thought I'd share with you the few bits I bought on my first trip as they are rather, well, lush. I think the main reason I've never been in before is because the Birmingham branch is outside of the Bullring and when I do get to make a trip into town, I rarely have cause to venture out of the main shopping area. A poor excuse but my excuse nonetheless. I went in last week during a day out in Solihull, for a change of scenery and because I wanted to pop into Hobbycraft, and I'm really glad I did because it's such a fascinating store. At first, the smell is quite intense - a bit like The Body Shop but amplified and with a base note of talc. I soon got used to the store scent and had a browse around the shelves, reading the quirky names of the products and seeing what would take my fancy. The sales assistant soon came over and said if I had never been to Lush before, I needed to try the hand scrub and conditioner mix as it was his favourite thing to get newbies such as me to try. He was right, it was a real treat for my hands. The experience felt really nice and my hands felt super soft in seconds. I was keen to pick up a lip scrub as I've heard great things about these and after trying the bubblegum and popcorn flavours (the latter is both salty and sweet), I chose bubblegum. It's a sugar based scrub that literally is good enough to eat and leaves your lips lovely and smooth within seconds. A simple way to achieve a perfect pout! 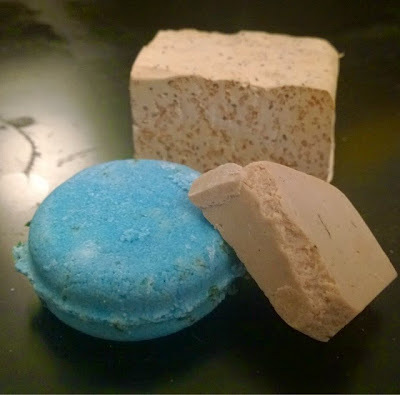 Next, the shampoo soap bars caught my eye. 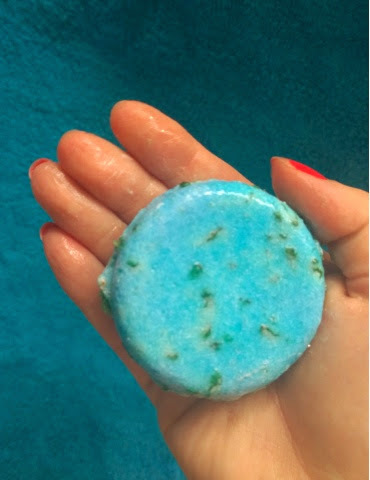 Shampoo... in the form of a bar of soap? Sounds a bit bonkers but the assistant assured me that they were really effective, lasted ages and were great if you were going on holiday as you could use them all over. I decided to give one a go and chose the Seanik bar as it contains sea salt, seaweed and lemon oil, plus other essential oils, to give your hair a boost. I've since used this a few times in the shower and whilst it feels strange to use a bar of soap on your hair, this lathers really well, really quickly and leaves my hair feeling squeaky clean. As with all Lush products, it smells great too, and for products such as this, that's a real plus point (for facial skincare, you don't need or want fragrance in your products as it's pretty unnecessary and could be an aggravator for your skin). My final stop in the store was to a counter that looked like it had a selection of multicoloured cheeses, all stacked in different sized blocks, on display. This was in fact a selection of different cleansers and shower soaps which you buy according to weight and one in particular caught my eye. It's called Porridge because it contains oats and it's well suited for cleaning and calming sensitive skins. With psoriasis patches over my body, some shower gels can sting a bit, so I thought this would be great for me to try and I have really enjoyed using it since. It's gentle, lathers nicely and most importantly, my skin seems to like it too. 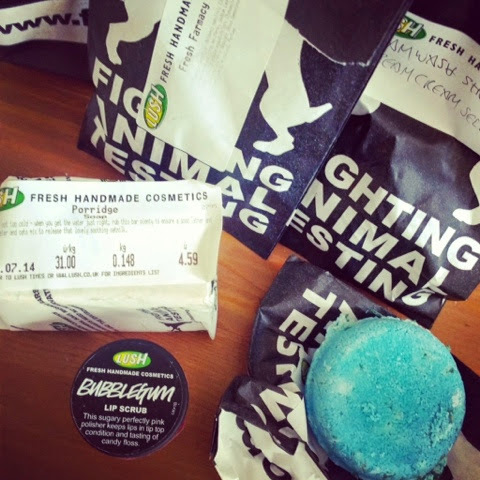 A trip to Lush is like walking into the Willy Wonka shop of the beauty product world. Tantalising smells, unusual ingredients, brightly coloured products. There seems to be a soap, lotion or potion for everything, handmade, cruelty free and full of lovely natural ingredients, and I'm sure my first visit won't be my last. Are you a lover of Lush? What products do you recommend? I used Lush all the times years ago but have to admit that it's a bit pricey for me these days. Nonetheless, I'm also a fan of the shampoo bars... And the smell in the shops is just out of this world! This one was around £5 and The Body Shop does a lip buffer stick which was probably around £8, so not bad really. They are good to use once or twice a week and I feel a difference straight away.